For SALE we have a Top Notch 1971 Plymouth Cuda 340. 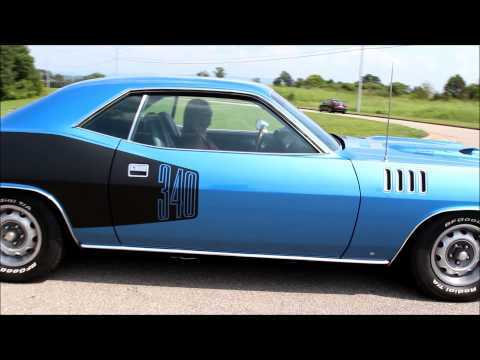 This was the second year for the E Body Cudas. This car has had a complete Rotisseries Resto and features the Matching Numbers 340-275 HP engine and the Matching Numbers 727 Trans. Also, it comes with 2 build sheets, the paperwork where it was bought new, and the original title. When you walk around this car the body is Laser Straight and looks better than when new and all the gaps are Great. This car is covered in the Bright Blue Poly Paint that is accented by the Black Billboard Stripe which was the factory option on this car. Also, it has the Sport Hood and Road Lights that were factory options for it as well. This Cuda has all the extra molding “drip rail/deck lid” The chrome and stainless was also removed, cleaned and polished and what wouldn't clean-up was replaced. To finish it off it has the factory dual exhaust with the correct Chrome tips. It's sitting on a set of Factory Ralley Wheels and New tires. On the inside it is done in black. It has the correct High Back Buckets. Also, it has the console with Woodgrain Panels and the factory Am Radio. When this car was restored the same eye for the detail that's seen with the exterior is evident on the inside. All the seats ride like new and everything has a good tight fit. Under the hood it's powered by the matching numbers 340 275HP engine with the 4BBL carb that's mated to the Matching Numbers Heavy Duty Auto Trans. The rear end is the correct style 8 ¾”. Under the hood it's all painted correct with all the correct stickers as it would have been when new. This ride has Power Steering and standard Brakes. When you look under it the floors are as slick as the body. They are painted body color and it has all new bushings front to rear. Along with new fuel tank and lines and new brakes and lines. This is one of the nicest Cudas on the market today. If we can help you in any way with questions or a specific picture, you can call our office at (865)988-8088. Or feel free to call Daniel at (423) 807 0600, Devvin at (865) 256 2366, or you can e-mail us at sales@smtclassics.com.